May is full of new beginnings - in lots of different areas. Like our #TITANIUMfamily of reference-class instrument cables, which now has a brand-new member – the TITANIUM Microphone Cable. Brian Vibberts, well-known hit producer and four-times Grammy-winner, has also joined the #KLOTZfamily; he now uses an M5 Microphone Cable. Our ProAVM sector also has some news – headed by the revolutionary SmartBeam Expanded Beam Connector, with up to 4 lenses for optical fibre applications. The connector can be cleaned with nothing more than clear water and a cloth. Professional power cables with powerCON TRUE1 connectors are rugged enough for the most challenging open-air performance. And the HD01P15 Hybrid Cable transmits control signals and mains power in a single cable – a saving in cabling efforts that will relieve many a production team. Maximum performance in Premium class! 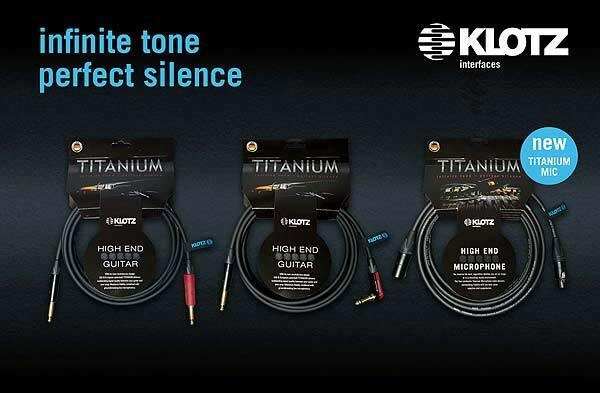 KLOTZ TITANIUM – A revolutionary patented cable design for instrument and microphone cables that hones their acoustic and mechanical properties and redefines the concept of “high end”. Backed by decades of experience, we’ve produced cables that – incredibly – are actually superior to our previous top-of-the-range products, offering outstanding sound that’s virtually free from microphonics. KLOTZ TITANIUM is so rugged and solid that it reduces subsonic noise, motion noise, static and interference to negligible levels. We spared no efforts to achieve this! A cable with this pedigree must be able to communicate the very essence that makes the human voice, or an instrument like the electric guitar, such a unique listening experience. Every nuance of expression must be clear; great emotions must be conveyed with directness and sensitivity. In fact, we’re so convinced of this ultimate pro level cable that we’re offering a lifetime guarantee. Each and every TITANIUM Cable is manufactured in Germany and undergoes a comprehensive battery of tests before being shipped to retailers. By taking this care, we safeguard the lasting quality and outstanding sound of this reference-class cable. This hybrid cable can transmit analogue audio signals and digital control signals (AES/EBU or DMX) plus the required power supply – in a single cable! It is thus the ideal choice for active speakers, dimmer switches, colour changers and scanners. The signal conductor features braided and foil shields for double protection against interference with 100% reliability. The additional drain wire makes the HD01P15 significantly easier to handle compared to similar cables: the braided and foil shields can be cut together and only the drain wire – the electrical contact to the two shields – is soldered. The cable is available with supply main conductor cross-section of 1.5 mm² or 2.5 mm². The 1.5 mm² version guarantees power supply up to 60 m, the 2.5 mm² version up to 100 m.
The drain wire threads provide virtually complete protection against cable twisting and give the cable its uniformly round shape despite containing two elements of different thicknesses (signal conductor and supply main). Even great products can always be made a little better. That’s why all our products undergo a continuous process of revision and improvement. One of these improvements is a product update for RC5-SB1, our shielded RamCAT Long Range Cable. The new version, RC5-SB1X, has a solid PUR jacket 7.1 mm in diameter (its predecessor, RC5-SB1: 6.8 mm). The PUR jacket ensures that the cable’s interior is well protected and screened from outside influences. Like its predecessor, the RC5-SB1X can also be made up using any common connectors, such as RJ45 and etherCON. Outdoor events require rugged cabling with maximum flexibility in every respect – the perfect setting for our Power Cables with powerCON TRUE1 Connectors! The heavy-duty TITANEX® rubber-sheathed cable (H07RN-F 3G1,5) is made up with a rubberized Type F earthed plug and powerCON TRUE1 socket. Alternatively, the cable is available with TRUE1 plug and socket. powerCON TRUE1 Connectors comply with the IEC 60320 standard and hold VDE and UL certification. These cables feature high mechanical durability, can be connected under load and are available in practical lengths of up to 20 m – the ideal companion for tough outdoor performances! Brian Vibberts is a 4-time Grammy Award winner. 2014 Grammy Nominee and has participated in the making of albums that have resulted in a total of 267 Grammy Nominations and 75 Grammy Awards Winners! Brian is always pushing to get the best sound from his recordings and mixes. Technically and creatively, he has recorded or mixed many multi-platinum artists in many genres, including Michael Jackson, Aerosmith, The Pussycat Dolls, Bon Jovi, Natasha Bedingfield, Green Day, Trace Adkins, Faith Hill, Toby Keith, Ice Cube, Boyz II Men, Elton John, Eric Clapton, Chick Corea, Brad Paisley, Ringo Starr, Mariah Carey, Tony Bennett, and many more. Forget the cleaning pen - all you need to clean innovative KLOTZ SmartBeam Expanded Beam Connectors is pure water and a lint-free cloth. The plastic cap with seal provides protection against dust and water ingress to IP 67 rating, and is therefore ideal for applications in challenging conditions. The 2 to 4 lenses of SmartBeam Connectors have an abrasion-proof coating and are dust and dirt-resistant. They can be simply cleaned with water and dried with a lint-free cloth. And the SmartBeam can easily handle over 3000 mating cycles – yet another argument in its favour! BroadcastAsia2015 is Asia’s truly international exhibition that is recognised as THE networking, knowledge and sourcing platform for the pro-audio, film and TV industries. Professionals from around the region will congregate to network, exchange business ideas, gather market information and source for the latest products and solutions. We will once again be present as an exhibitor – now an annual tradition for us. Our presence will focus on our latest developments in the field of optical solutions, including our SmartBeam connector family and copper-based product range. Kamal Mahtani, KLOTZ Cables PTE Singapore, and Alexander Rinklef from our German headquarters look forward to welcoming you to our stand 4D4-01.